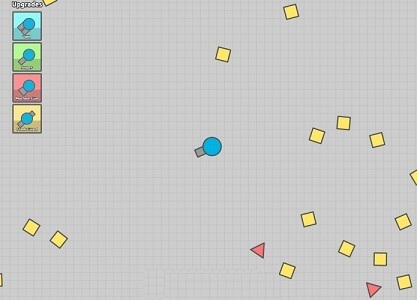 - At the beginning of diep.io, you will be too weak to fight with other players. Avoid direct confrontations at least to the level five. It is important to keep in constant motion to avoid traps and surprise attacks. Even when well evolved, don’t stop moving. - You must destroy obstacles and other players to increase the tank level. Locate the map geometric shapes in blue, red and yellow and destroy them by shooting - or using your own body. Yellow obstacles give less experience red, which in turn provide less than blue. By killing a player, and move up the rankings of the server, you will get a good amount of experience points. - Upgrade them according to your goal in the game. If, for example, the class you want to use is Sniper, your tank will surely need more damage, speed and penetration, since it will not fire as many bullets as Machine Gun. Increase maximum life and regeneration rate when you feel being very persecuted or when the server is full. - Upon reaching level 30, the player evolves into a stronger form of the class. In Twin class, for example, can trigger using three guns. With the Sniper, the viewing range and trigger further increase, while Machine Gun class allows you to choose between keeping the machine gun or turn into a destroyer, with a larger and more lethal projectile. - Choose the class carefully, as some have disadvantages. Snipers will not be able to position themselves well if a Twin shoot continuously in his direction, but the class is good against Destroyers. Upon reaching level 45, the highest form of your cannon will appear, which can be anything from an Octotank - shooting bullets in eight directions - until an Overlord, which can change the direction of the shots. - The game ranking is made up of the players who killed on the map. In addition to gaining a better position in the list, you get experience for each defeated opponent. A good strategy is lurking enemies and attack by surprise when they least expect it. 1. Fully upgrade Body Damage and then Speed. 2. Select either Sniper or Machine gun, then fully upgrade both health and regen. 3. Select the Destroyer class. 4. Fully upgrade bullet damage. Now, a single bump can devastate any enemy at every level by at least half-health, and your shots can KO people instantly. Now, see if you can do this to level 45 and beyond. I dare you.